More detailed information can be found in the User Manual [PDF]. Opening any book in a viewer window (also called a pane) will give you a number of options for scrolling or manipulating the book. These are arranged around the central image. 2. Navigate back one image in the book. 13. Zoom, Pan, or Rotate the Current Image. 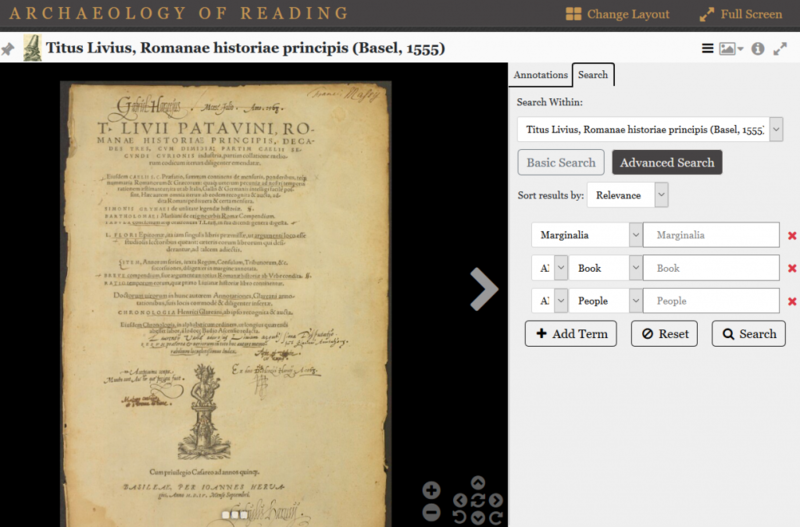 The opening screen of the AOR viewer is a gallery consisting of all the books that are part of the AOR corpora. 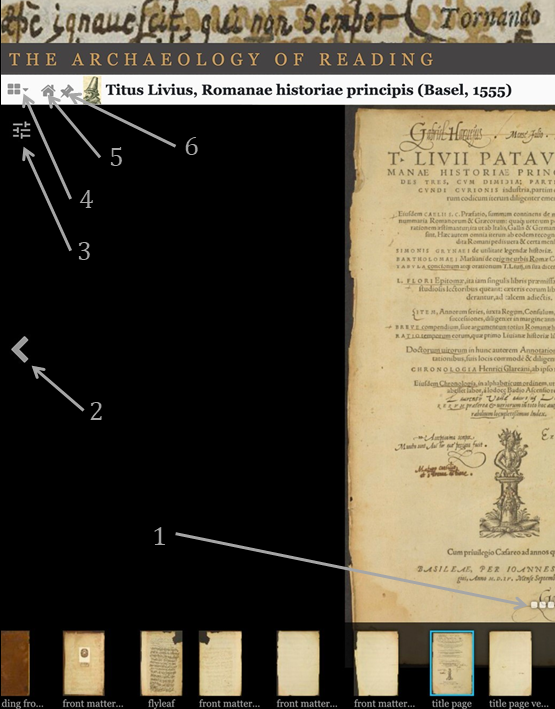 By clicking on one of the thumbnails, a particular book is opened in a “workspace,” a panel in the AOR viewer consisting of the digital image and a transcription viewing and search panel. In the workspace, one can scroll through the images by clicking on the arrows at the left and right of the image. One can also modify the way in which images are displayed (e.g., as thumbnails or openings of a book) by clicking on (10) in the upper right-hand corner. 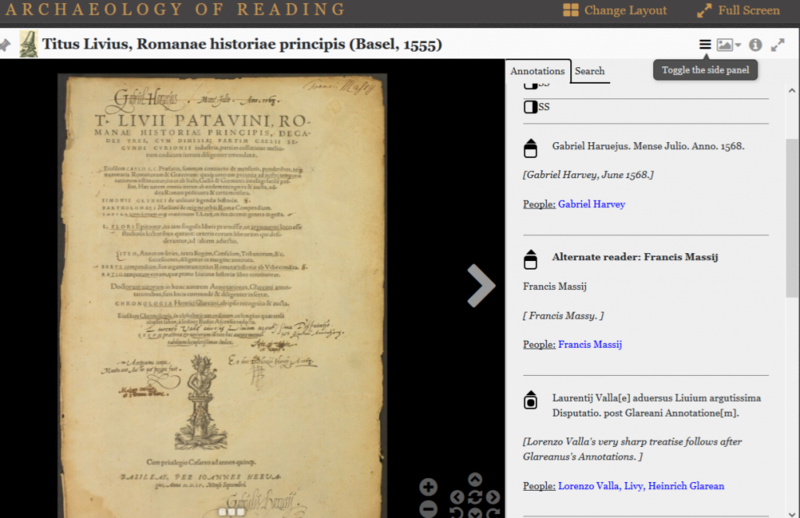 The AOR viewer allows for viewing the images of several books next to each other. This can be done by opening a new workspace (click on the button to which arrow 2 points or on “change layout” (arrow 8) in the upper right-hand corner). The home button (3) can be used to immediately return to the gallery page. The images can be manually manipulated by several buttons located in the lower right-hand part of a workspace (6). The user can zoom in and out, rotate the images, and reset the view (i.e., restore the original view by undoing rotation and zooming actions). The color and contrast settings of the images can be manipulated by using the button to which arrow 1 points. 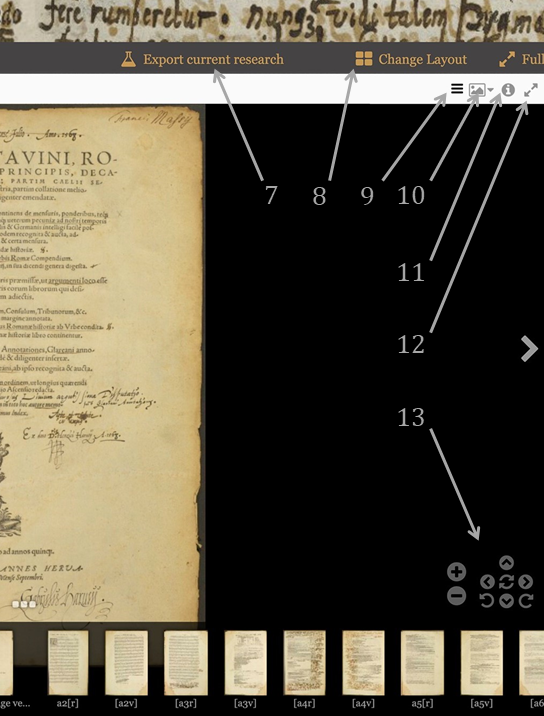 Clicking on (9 in the drawing above) opens the transcription panel, which displays data derived from the digital transcriptions, including the marginal annotations, their translations into English, and the symbols used by Gabriel Harvey and John Dee. The icons on the left of the transcription of the marginal notes and symbols indicate the position of the annotations on the printed page. Shaded areas indicate margins, a dot in the center means that the note is in the text. A separate tab within the transcription panel opens the search panel. There are two ways to search AOR: a simple string-based search, which returns keywords, or an advanced search. The advanced search (shown at left) allows for searching particular annotations, including types of annotations which are not displayed in the transcription panel but which are part of the digital transcription (and have been included for search purposes in particular). Both simple and advanced searches can be executed within the individual book or the AOR corpus as a whole. Search results are arranged based on relevance and page order. Each item in the search results is a clickable link. A left mouse click opens an item in the existing workspace; a right mouse click enables the user to open the item in a new workspace. For more detailed information on the AOR search functionalities, see the User Manual [PDF]. Every image accessible within the viewer, along with the results of many basic and advanced searches, are given a stable URI which makes it possible to navigate directly to that page or search from an external website. Within any one session, a user’s steps in the viewer are also logged and retrievable. You can export your research findings as a plain HTML file or as an RMap linked data graph by navigating to the export current research screen (7). For more information on exporting and preserving your research in the AOR viewer, see our page on HTML and rMap export or consult the User Manual [PDF].